I often have dancers in my stories as I like dancing, feeling body movements, be it in fighting, sports and passion. I love writing to music. Music has always been an inspiration and thus I like the emotional aspects I can draw from it. RUNES OF MAGIC - SHAREENA and RUNES OF MAGIC - ASIYA have been written while listening very intensely to these soundtracks. Of course there where other scores as well, ranging from Les Miserablés to John Williams Lost World and more. I'll tell more soon. 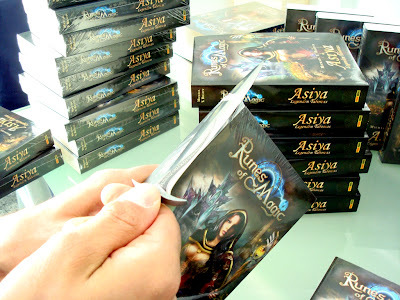 NOVELS: Runes of Magic - Asiya has been released! It is a strange thing... now that my latest novel has been released and I got a number of copies to sign, it all becomes real now. 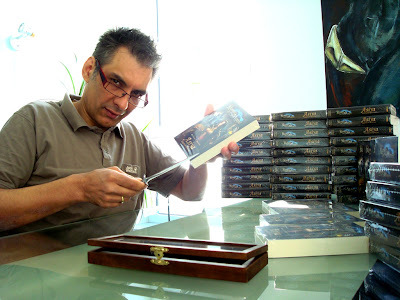 Tomorrow my fourth novel - and the sequel to RUNES OF MAGIC - SHAREENA, will be shipped. I am proud to announce RUNES OF MAGIC - ASIYA! But where did it all start? Well, in the first novel, where the magician Samuel ressurects the slain priestess at a sacred circle of ancient stones and conquers her love eventually. I love creating crosslinks and thus I've added bits of information in the first novel already. so, when I started developing the ideas for RoM-book 2, I started in Ravelfell, the place where Asiya was brought back to life... just to reappear... differently. Wow, I am honoured my dear publisher. I found a page in the preview magazine of Panini (the publishing company of my novels) and they put in a badge: "Tipp der Redaktion", which means recommendation or insider tip of the editors. Well, thank you very much. I am flattered and honoured (and I like being on the same page as the Star Wars novels;-)). In SHAREENA our hero starts in the pioneer village, while in RUNES OF MAGIC: ASIYA we'll begin our tale in Harf, a trading outpost in the cold and snowridden highlands of Ystra. As you may know from the novel announcement at Amazon, Asiya will be abducted. But how did I work on this? Well, usually, when writing for a game I start with playing it and going on a 'foto-safari', meaning, making lots of screenshots, looking for inspiration... But not only for inspiration. I want my readers to experience places and people they know from the game as well.